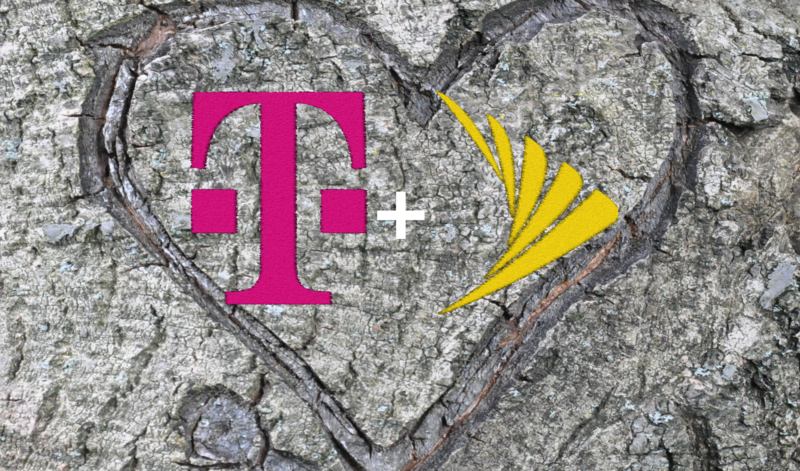 Sprint and T-Mobile weave a complicated relationship. For years they've desired each other, drawn inexorably to that most corporate copulation: the merger. In a landscape run by AT&T and Verizon, the two star-crossed lovers have struggled separately to carve a little chunk of the world (including the US telecommunications market) for themselves. And, according to a report by Reuters, after a long and conflicted courtship, their paths and profits may soon be joined. For a concise history of the T-Mobile/Sprint merger: First it was on, then it was off, then it was on again. According to speculations at the time, the reason for last year's failure stemmed from difficulties in negotiating voting control between SoftBank (Sprint's majority shareholder), and Deutsche Telekom (T-Mobile's owner), resulting in a last-minute cancellation of the deal. If the report by Reuters is to be believed, that impediment has been overcome. If the two wireless providers do merge together, the result would be a single company with over 127 million subscribers, bringing it to within spitting distance of AT&T (143.8 million) and Verizon (~150 million). Reuters' sources caution, "there is no certainty that a deal will be reached." In addition to Sprint's documented history of cold feet, US regulatory approval would likely be required, and the current administration has been wary of large-scale corporate mergers, as in the case of the AT&T/Time Warner deal. More details for the potential merger have been revealed today by Bloomberg. Word is that Sprint is being valued at around $24 billion in the deal, which will see T-Mobile receive a 42% stake in the resulting company, with a larger 69% voting interest. That price values Sprint at around $6.10 a share, which Bloomberg notes is below the $6.50 price set at the end of trading today. After-hours trading saw Sprint shares fall as low as $5.68, though they have since rebounded to just a hair under $6, at the time of writing.